12 different health conditions will be tested for as part of the scheme. 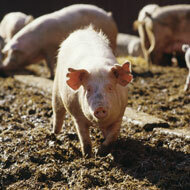 New scheme will allow pig farmers access to post-mortem data. The Agriculture and Horticulture Development Board (AHDB) are inviting pig farmers to join a new scheme that will provide access to post-mortem data on their pig herd at slaughter. The aim of the scheme is to provide information on low-level diseases that the farmer may not be aware of. Through this close observation, it is hoped that health and welfare will improve and performance increased. 12 different health conditions affecting the heart, liver, skin and lungs (including enzootic pneumonia and pleuritis) will be tested for by a veterinary assessor at the time of slaughter. A full report will then be provided that can instigate discussion and health plans with a veterinary surgeon. Results from the report can be useful in assessing any recent changes to feed, conditions or vaccination programmes. This new scheme is a replacement for the British Pig Health Scheme (BPHS) that was halted in October 2017 so that AHDB could partner with abattoirs and veterinary surgeons to produce an improved process.